Save the Children’s mission is to help children in need get the early education they need to succeed — in education and in life. To achieve their ambitious goals, they needed to grow their pool of donors. 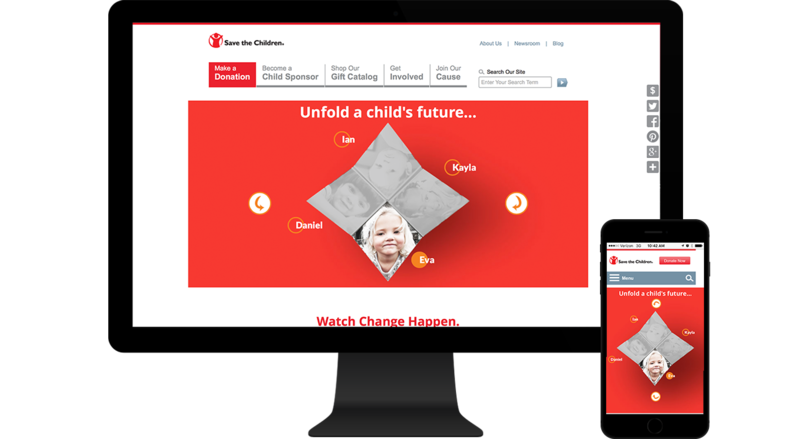 We were asked to create a new campaign to raise awareness and incent donors to contribute to the early learning programs that benefited children in poverty in the U.S.
With our partners at Save the Children, we developed a campaign idea designed to evoke the nostalgic feelings of hope and possibilities felt in childhood. The “Invest In Childhood. See the Future Unfold.” brand idea literally came to life through the iconic use of the paper fortune teller, still so popular decades after the first children conceived of it. The fortune teller was brought to life in-store with physical paper tellers at the point of donation at register, online via a digital fortune teller and through social channels. These interactive devices began with children in need and unfolded a story of hope or despair depending on the real-life journey of a child getting early education or not. The campaign succeeded in not only increasing the donor pool but driving brand partnerships which got the word out exponentially.